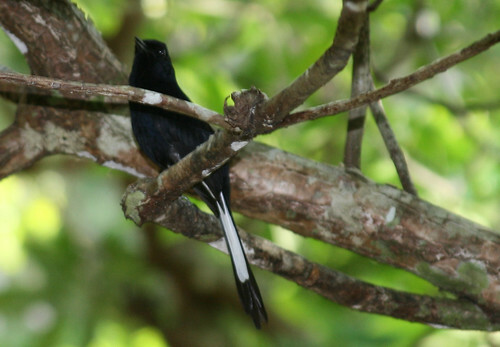 The white-vented shama, also known as the Palawan shama, can be identified by its all black color with blue gloss except for the lower flank. The feathers under its tail (the vent) are white. Females are a duller black, with buffy white feathers on the lower belly. The white-vented shama measures 21 cm. It is found in forests, forest edge, and secondary growth where it feeds on insects. The white-vented shama is a fairly common to common species endemic to Palawan.